His voice is one of the most iconic in football, having covered the game for over four decades and providing the soundtrack to some of the most memorable occasions. But it was a chance invite into Anfield's famous Boot Room by Joe Fagan which serves as one of the highlights for BBC commentator John Motson, who gave Liverpoolfc.com an insight into what it was like covering Liverpool games during that treble-winning season. "I was an occasional visitor to Anfield at the time," said Motty. "But I was fortunate enough to be invited into the Boot Room, which was an absolute privilege. "The invite came about by chance really; I had to be walking down the corridor after conducting post-match interviews and Joe would pop his head out of the door and say: 'come and have a beer, lad' and you were presented with either a brown ale or a lager, not champagne or anything like that. "I can't imagine many media personnel got that opportunity, and the thing I remember about it was how straightforward and uncomplicated the whole set-up was. "Joe showed me the famous 'Bible' with the team's training reports all written down in long-hand, which went back years. "I could see then that it wasn't rocket science, there wasn't any major coaching advancements, it was just the Liverpool way working as it did season after season. 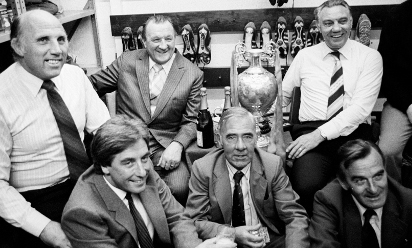 "Joe and Ronnie (Moran) were very clever at sussing out who they were playing against and would find the way of winning the game. Even the pitch conditions were given deep consideration, which wasn't a trend at the time. "Everything from top to bottom at the club worked perfectly, and it was simply a great time to be going to the club whether it be as a supporter or in a working capacity. For me, that period during the 1980s, with Joe in the Boot Room was the real 'Liverpool experience'." Motson went on to explain how the experience of actually commentating on the game was just as pleasurable as the warm reception he received behind the scenes. He added: "Anfield at that time was a fantastic place to visit. 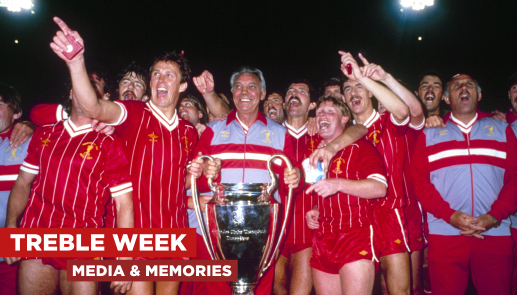 There were big European nights every season and in truth no-one came close to them. The things was that Liverpool were undisputed top-dogs at the time, but no-one shouted their mouths off or boasted, it was just genuine blokes doing their jobs. "The team was fantastic to cover as well. You had Graeme Souness who hardened the team up and the likes of Ian Rush who was just a sensation. "There really wasn't a weakness in the team, or at least that wasn't displayed to the opposition on the field. At the time, they were the best." Click here to read Clive Tyldesley's memories on the top LFC secret he had to keep.